When many lenders abandoned automotive lending last year, Long Island dealer Keith Donnelly was stumped. Then he turned to credit unions, which had financed about 10 to 15 percent of deals at his three stores. With the help of GrooveCar Inc., a 10-year-old Hauppauge, N.Y., loan aggregator that provides a single portal to access many credit unions, Donnelly steered his consumer loan contracts to 27 credit unions. For the past eight months, he says, 70 percent of his retail financing has gone through credit unions. "It's worked out fantastic," says Donnelly, who owns two dealerships in New York and manages a third. "The money has been there for us. There are plenty of funds to finance our customers." As banks and captive lenders slashed consumer loans, aggregators such as GrooveCar have played a key role in helping credit unions fill the vacuum. According to Experian Automotive, credit unions' share of automotive consumer lending jumped to 28.5 percent in the fourth quarter of last year. For most of the prior two years, it was below 23 percent. Donnelly co-owns Grand Prix Jeep-Chrysler-Subaru in Hicksville, N.Y. and Garden City Jeep-Chrysler-Dodge in Hempstead, N.Y. He is general manager of Westbury (N.Y.) Jeep-Chrysler-Dodge. 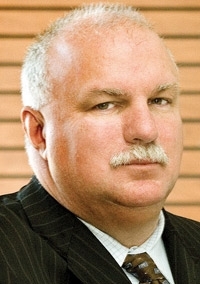 For dealers such as Donnelly, the chief benefit that aggregators provide is convenience. Previously, credit unions competed with dealers to provide consumer loans. Now, aggregators provide one-stop shopping for dealerships that want to do business with numerous credit unions. Dealers pay a fee to be part of such a network. Aside from funneling loans to credit unions, aggregators provide loan application software to speed the approval process. David Jacobson, president of GrooveCar, says the intermediary function is crucial. "We manage the relationship with proprietary software that allows the consumer to finance at a dealership through a credit union," he says. By contrast, individual credit unions may lack the scale — both in lending power and staff — to attract dealers. Mark Brown, vice president for marketing and digital services at DealerTrack Holdings Inc. in Lake Success, N.Y., says some dealers work with individual credit unions. But, Brown says, "For any individual credit union, it's still a small volume from a dealer perspective." 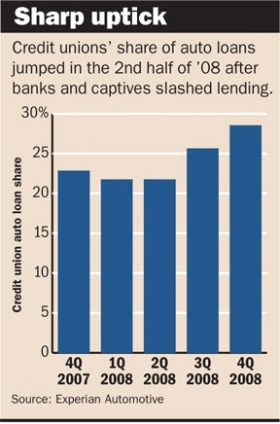 Credit unions are eyeing further increases in market share. Noting last year's big gains, Adrian Dominguez, CEO of Credit Union Acceptance Co. in Houston, says the increase in automotive lending "was absolutely crazy, to put it bluntly." His company, which links 110 credit unions to more than 600 dealers, projects a 10 percent drop in loan volume this year. But, Dominguez says, "I think there is still an opportunity to grab market share." Credit unions showed an aggressive streak with the Invest in America loan program. The program offers low-rate loans on GM and Chrysler products, along with discounts offered to credit union members by the automakers. Financing is available through 1,181 credit unions. Through March, the program sold 85,847 new vehicles. Invest in America began in December as a test program in the Midwest, organized by the Michigan Credit Union League. Credit Union Direct Lending in Ontario, Calif., helped launch the nationwide program in February with CUcorp, a suburban Detroit marketing company. CUDL links more than 700 credit unions to 9,000-plus dealers. Last year, the company added more than 100 credit unions and 1,300 dealers, says Joe Greenwald, CUDL vice president of marketing and communications. Credit Union Direct Lending will look for more opportunities to work directly with automakers, Greenwald says. Last month it ran a pilot program with Kia Motors America in the Northwest. After the credit collapse, credit unions were positioned to expand lending because of their conservative underwriting policies. Says Greenwald: "Credit unions were a little more prudent in their lending practices, so when things turned, they didn't turn as [bad] on credit unions." Credit unions and dealers are learning to deal with each other. Indirect lending — making loans that originate at dealerships — is new for many credit unions. Donnelly advises his fellow dealers to make sure their paperwork is "absolutely perfect" because the approval process can be slow.